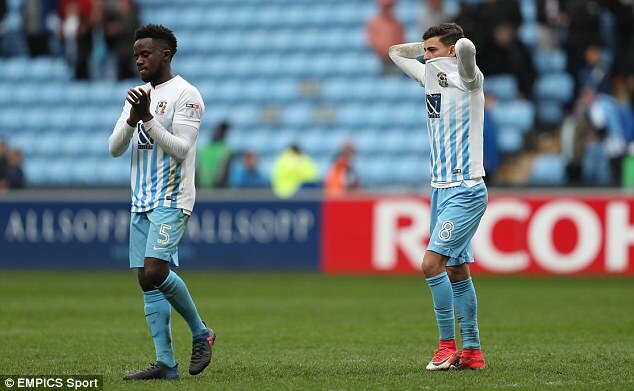 Coventry City have become the first founding member of The English Premier League (1992/1993) to be relegated to the fourth tier of English football. Since the inception of The FA Premier League as it was known in 1992/1993, 47 different sides have competed in the competition, and whereas now there are 20 sides each season, in the beginning their were 22;Arsenal, Aston Villa, Blackburn Rovers, Chelsea, Coventry City, Crystal Palace, Everton, Ipswich Town, Leeds United, Liverpool, Manchester City, Manchester United, Middlesbrough, Norwich City, Nottingham Forest, Oldham Athletic, Queens Park Rangers, Sheffield Utd, Sheffield Wednesday, Southampton, Tottenham Hotspur, and Wimbledon. Following yesterday’s 1-1 draw at home to Charlton Athletic, Coventry City were condemned to League Two next season; their first stint in the fourth tier since 1959. After 34 years of consecutive top-flight football, of which nine years were spent within The Premier League, Coventry City slipped into The Championship in 2001 and then League One in 2012 before yesterday slipping to a third relegation in 16 years. Where are the founding members now? Currently seventh in The Premier League, Arsenal are in real danger of not qualifying for The Champions League for the first time in nearly 20 years under Arsene Wenger. Villa suffered relegation from The Premier League for the first time last season, bringing an end to their 24 year run in the competition. This season, firstly under Roberto Di Matteo and then Steve Bruce they struggled to mount a serious challenge for promotion back at the first attempt. A side in danger of being relegated to the third tier of English football this season, Rovers currently occupy a place in The Championship’s relegation zone. They have recently appointed former Coventry manager Tony Mowbray and fortunes have improved but it may be all too little, too late. Chelsea look set to be crowned Premier League champions for a fourth time under new manager Antonio Conte after a dismal campaign defending their 2014/2015 where they finished 10th last season, with Leicester City completing an unlikely title win. Relegated to the fourth tier for the first time in 58 years after a dismal campaign which has seen four different managers, this weekend; the first of any founding Premier League club to be relegated from League One. Former Coventry City defender Sam Allardyce has steadied the Crystal Palace ship since January, leading The Eagles away from The Premier League drop zone for the original relegation/promotion yo-yo club. Romelu Lukaku is currently leading The Premier League scoring charts for The Toffees as they look to sneak into The Champion’s League places under Ronald Koeman. A miraculous fifth placed Premier League finish in 2001 was as high as Ipswich finished, with two spells in the Premier League. They now currently find themselves in the bottom half of England’s second tier. Leeds could be on the brink of finally securing promotion back to The Premier League, with Gary Monk leading them to The Championship play-off places. United started the inaugural Premier League campaign as Division One champions and spent 12 years at the top, before falling into The Championship and League One. Three-times runners up in The Premier League, most recently 2013/2014 to Chelsea, Liverpool have failed to reestablish their domestic dominance from the 1970’s and 1980’s where they won 20 league titles. Currently managed by Pep Guardiola, the ‘other’ Sky Blues have two Premier League titles to their name, but had once slipped down to the third division of English football before climbing back to the top of the football pyramid. The most successful club in The Premier League era, with 13 league wins out of 24, but they have failed to win the league since Sir Alex Ferguson retired after reclaiming the title from “the noisy neighbours” Manchester City in 2012/2013. Currently second bottom in The Premier League, with an instant return to The Championship looking likely, with only six games remaining and six points from safety. Relegated from The Premier League in 19th position last season, promotion straight back seems to be out of the question now this season, with The Canaries down in 10th with six games to play. Forest finished bottom of the table in the inaugural Premier League season, before winning promotion back at the first attempt. They would then survive in the top flight before suffering relegation again in 1999 and have at one stage dropped down to the third tier before achieving promotion back to The Championship. Oldham looked in serious danger of dropping into League Two until John Sheridan returned as manager for a fourth time. After pulling away to safety, their League One status is looking almost secure having been in the third tier for the last twenty years. They enjoyed a two-year stay in the Premier League when it was founded. Rangers endured a 15-year exile from the top-flight, slipping as far as League One before returning in 2011. However, despite heavy investment, they couldn’t maintain their top-flight status for long and are now back in The Championship. Sheffield United were crowned Champions of League One this weekend, United were relegated from The Premier League in it’s first season. After 12 years away they finally achieved promotion back, but were unable to stay up and were relegated straight back to The Championship where they will be once again next season. A solid top-flight side until their relegation in 2001 alongside Coventry City, The Owls tumbled down into League One but have stabilised and are missed out on promotion back to The Premier League in The Championship play-off final in May 2016. They look set to be involved in the play-offs again this season. Another side who have been relegated down to the third tier of English football since 1992/1993, Southampton are back competing in the top half of England’s top division after winning League One and then confirming promotion back to The Premier League with a 4-0 home win over already relegated Coventry in April 2012 where The Saints have remained since. Currently, Tottenham look like the only side to prevent Chelsea from winning The Premier League this season, sitting four points behind their London rivals in second. They started the Premier League era as a mid-table side but in the last decade have firmly established themselves in the top 6 and as title contenders. Regulars in The Premier League until their relegation in 2000, and a change of ownership led to a controversial relocation in Milton Keynes and the eventual collapse of the club in 2004. MK Dons are currently 12th in League One, whilst AFC Wimbledon, set up in protest to MK Dons are 13th after a meteoric rise through the divisions.